The graphs below show the growth of the U.S. monetary base over time. (The monetary base is physical currency plus reserve accounts held at the Federal Reserve.) 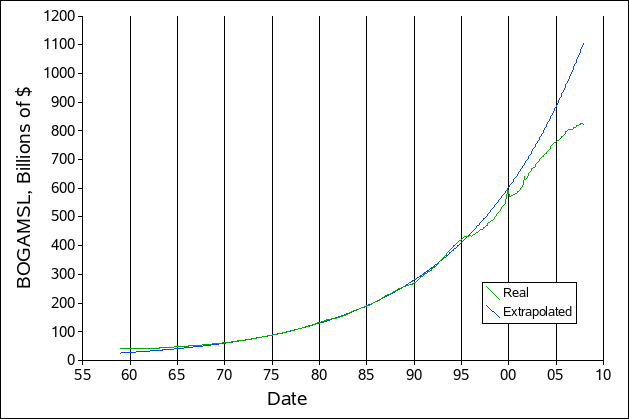 The blue trace is an exponential curve fit to 1975–1994, while the green trace is the raw data. 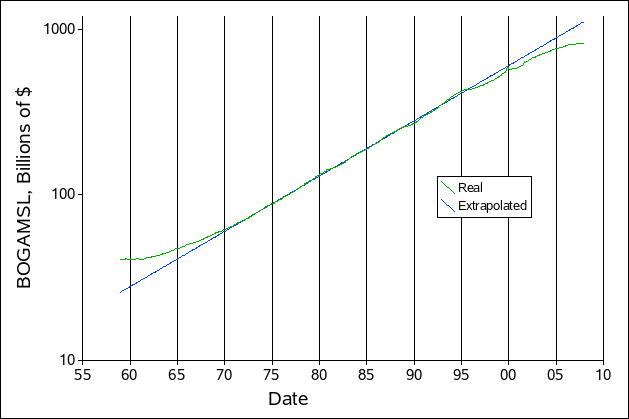 The first graph is plotted in log-linear form: a constant inflation rate (exponential growth) would be a straight line. The second graph shows the same data in linear-linear form. Note how the monetary base falls behind inflation in the mid-1990s. Money is being created but not being added to rainy day cash. I have no idea what this actually means for social stability. While there is less cash to help ride through glitches in the system, modern telecommunications makes it vastly easier to send money where it is needed. Sweep account rule changes during the early nineties are a likely explanation. Credit expansion never slowed. To me, credit and money are related, but not exactly the same.